The quest to find a salad dressing that we both enjoy is a never-ending and frustrating journey. Aside from Kraft Italian Dressing (which you can’t buy in Germany, as far as I can tell), my boyfriend generally finds all other dressings a real turn-off. As he’s a guy who isn’t overly-fond of his vegetables, I’m just so delighted that he enjoys salad that I’ll do almost anything to find an alternative to his beloved Kraft dressing. The problem is, unless it’s an Italian dressing that comes in a Kraft bottle, he’s strongly pre-disposed to find it disgusting. I’m easier to please, and have generally been satisfied with most other dressings we’ve bought or made. Depending if I get the balance right, my boyfriend doesn’t usually mind my standard homemade dressing of mustard, balsamic vinegar, salt and pepper. Household Management, to my surprise (I don’t know why I was so surprised – I guess I hadn’t imagined that the Victorians ate salad as much as we do), lists a number of different dressings for both meat and non-meat purposes. INGREDIENTS – 1 teaspoonful of mixed mustard, 1 teaspoonful of pounded sugar, 2 tablespoonfuls of salad oil, 4 tablespoonfuls of milk, 2 tablespoonfuls of vinegar, cayenne and salt to taste. Mode.—Put the mixed mustard into a salad-bowl with the sugar, and add the oil drop by drop, carefully stirring and mixing all these ingredients well together. Proceed in this manner with the milk and vinegar, which must be added very gradually, or the sauce will curdle. Put in the seasoning, when the mixture will be ready for use. If this dressing is properly made, it will have a soft creamy appearance, and will be found very delicious with crab, or cold fried fish (the latter cut into dice), as well as with salads. In mixing salad dressings, the ingredients cannot be added too gradually, or stirred too much. The trick is to really take her seriously and add the ingredients gradually. Unfortunately I didn’t believe her and an earlier, lazier attempt ended up in a semi-curdled ruin. 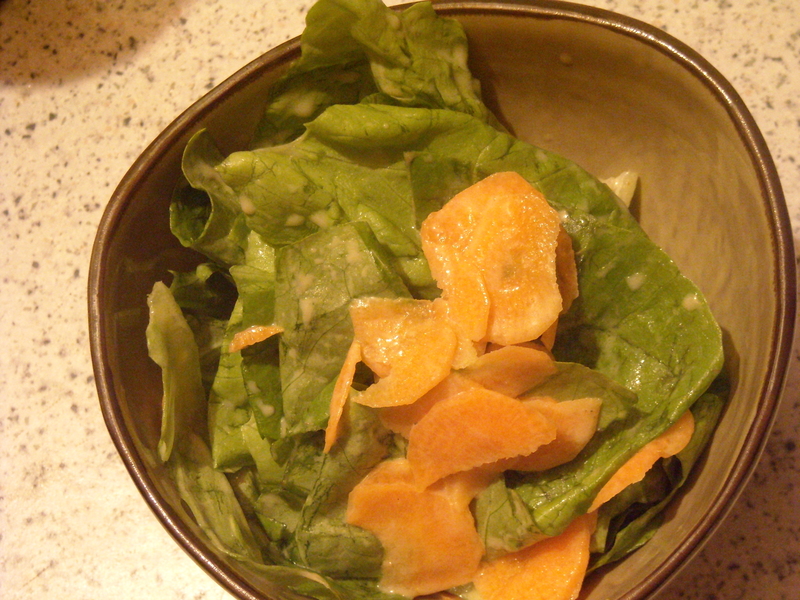 When I got it right, the outcome was a very nice salad dressing indeed, with a lovely creamy gold appearance. A little on the sweet side, but that just enhanced the base taste. For all other non-Kraft Italian Dressing addicts, Mrs Beeton’s dressing given above may be a very attractive substitute. This entry was posted on January 5, 2010 at 6:17 am and is filed under food. You can follow any responses to this entry through the RSS 2.0 feed. You can leave a response, or trackback from your own site.